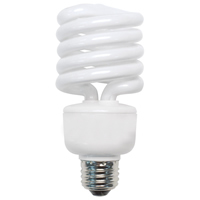 This compact fluorescent light from Overdrive Lighting consumes 105 watts of energy. The lumen quality allows the bulb to be a suitable replacement for a 400 watt incandescent light. The bulb has a mogul E39 base and a long average life-time rating of 10,000 hours. This light provides a daylight color.